After delivering a package, Baloo finds Kit talking to a Madam Una. Upon seeing Baloo (with a llama hat on), she mistakes him for the legendary 'Great Llama.' She then tells him of the legend of The Idol Of Doom. It's Baloo's destiny to find this idol of mass destruction that can only be destroyed by a hero (e.g. The Great Llama). Before Baloo can object, she slaps a bracelet that leads The Hero to the idol. The bracelet causes a chain of events that, through shear dumb luck, bring him to the temple the idol is hidden in. Meanwhile, they're pursued by El Gato, a man who seeks the idol for it's destructive powers. Christmas time is approaching, and Becky wishes it was snowing. When Molly asks when it's going to, Becky says it never snows in Cape Suzette, it only rains. Baloo tells Molly about a peppermint fairy that comes and leaves a peppermint under your pillow. 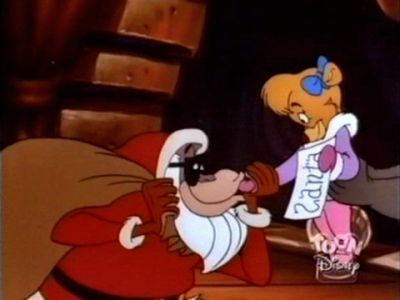 However, when Baloo forgets to deliver the goods, Molly begins to doubt this fairy... and Santa Claus. Not wanting to disappoint Molly twice, Baloo gets Louie to dress up as Santa and turn his restaurant into the North Pole. Baloo then takes Molly there to get her present. But Molly's present this year is a wish for snow for her mother. Determined not to disappoint, Baloo is going to drop soap shavings over Louie's to create the illusion of snow. But with a trip to Cape Suzette and back in his way, Baloo has to contend with Louie's impatient customers and Don Karnage's version of Christmas. Prof. Buzz gives Baloo and Kit a tour of his research and development section of Khan's business. 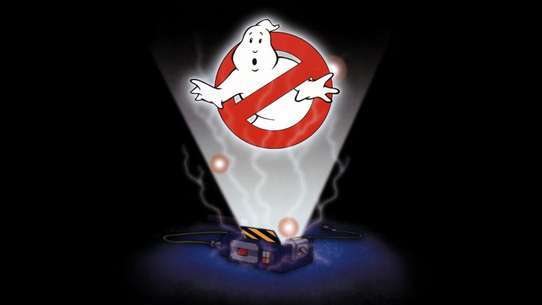 When they leave, Buzz overhears Perry, one of Khan's white-collars, on the phone with Miniversal Crop. Turns out he's going to steal Khan's Top Secret Flying Project for the rival corporation. Upon hearing this Buzz goes to inform Khan. But when Perry finds out Prof. Buzz is onto him, he alerts security that Buzz is the traitor. Buzz escapes with the Top Secret Project, only further incriminating himself. It's up to his best friends Baloo and Kit to clear his name and reveal who the real traitor is. Baloo's favorite record, handed down by his father, is broken and so is Baloo's heart. He finds the last existing record is for sale at an antique store for $100. With $50 of Kit's hard earned money for starting cash, Baloo sets out to show Kit that you don't need to work hard for 'easy money.' However, the easy street requires them to cross Trader Moe, who's not about to lose his trades to someone muscling in on his action. Baloo and Wildcat are assigned to deliver an Egyptian tablet to Aridia. The tablet has directions on how to find the lost treasure of King Utmost, and Don Karnage is not going to let this one slip past him. When they arrive, they find the Museum of Ancient History... coming soon. It's (going to be) run by Myra who is an archaeologist for the Ministry of Culture. 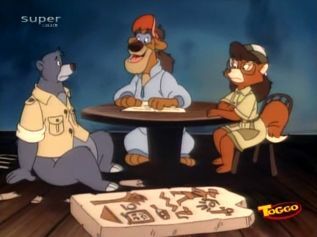 Baloo and Wildcat agree to help her find the location since she can't read the coordinates, but find that once they're involved, they have to survive traps, pirates, and a mummy that's protecting the treasure. With his High School reunion coming up, Baloo anticipates the arrival of his invitation. When none comes, he asks Louie where his invitation is. Turns out Baloo never graduated from Grade School. He decides to enroll in classes with Kit. This way he can graduate and still attend the reunion. However, along with school, he still has to make his deliveries for Higher for Hire. When this doesn't work out, the principal threatens to expel Baloo, he's allowed one last chance by taking an equivalency test. With Kit helping him, they attempt to make the impossible possible. Becky enrolls in the Better Business Boot Camp. In the meantime, Baloo and Kit are in charge. Baloo takes advantage of his own business and pairs up with Louie to deliver pizzas. 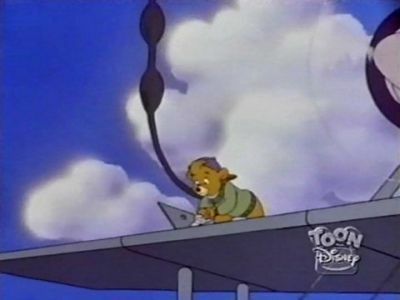 With no real business know-how, Baloo tries all the normal techniques on a larger scale. He ends up taking all the petty cash from Higher For Hire, buy rancid anchovies that make Louie (their only chef) pass out, and get the attention of the Health Department. Becky wins the Pazuza Sweepstakes and is going to receive $100,000. All she has to do now is send in the winning ticket by mail and arrive at the sweepstakes office by 8 AM tomorrow. Not wanting to take chances, she decides to go all out on the postage ($17.50). However, Molly has a school play, preventing Becky from getting to the post office in time. When she considers making Baloo do it, she's reminded of the fact that Baloo always messes up 'important jobs.' Then Molly suggests to just tell Baloo that it's a normal 'non-important' job. So Becky gives the letter along with $20 and tells him to send the letter SSTISDD (Super Speed, Triple Insured, Same Day Delivery). And the cherry on top: he gets to keep the change. Baloo goes to the post office, but stops at a fast food restaurant and spends $19.98 on food. He does, after all, get to keep the change, and how much does postage cost? Baloo ends up shipping the package 18th class, which takes 10 weeks to deliver. 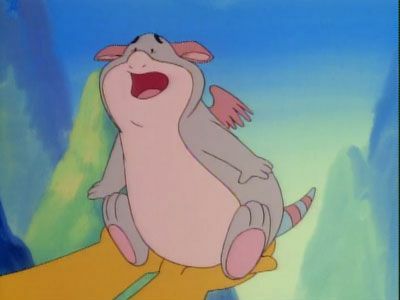 Kit wants to fly, but Baloo says that he's too young. When he learns that Thembria is training pilots as young as 12 years-old, Kit enlists. The piloting school is anything but training kids how to fly. General Spigot and Dunder are in charge of preforming the aerial flounder formation. Turns out Spigot accidentally ordered a whole fleet of small planes. To avoid punishments (or death), Spigot plans on having small kids in the plane creating the illusion that they're the appropriate size. Dunder is put in charge of bolting all the planes together, and the lead plane will be flown by a Tiny Bubbles, a professional Thembrian pilot. When Kit finds out that they will never be actually flying, he starts scheming how he's going to get himself in the air. At the Jungle Aces Secret Midnight Club, a new person is presented by Kit for membership. To everyone's disappointment it's Oscar Vandersnoot, a walking disaster. Kit says he deserves a chance to tell of an adventure of his own. Thing is, he needs to experience one first. They decide to visit Wildcat for suggestions. 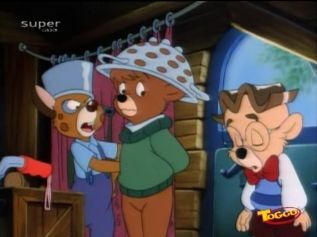 Meanwhile, Don Karnage plans to kidnap Oscar for a ransom. When they find him at Wildcats, they overhear something about a 'Secret Anti-Pirate Weapon,' which is just a canister of air that breaks open and unknowingly takes out Maddog and Dumpster. 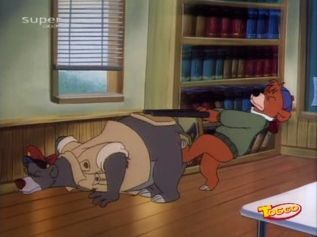 Baloo has to deliver some vegetables, but they tell Oscar that's code for delivering the weapon. The pirates hear this and then plan to kidnap Oscar and steal the weapon all at once. Becky can't find a date to the Businessman's Ball. 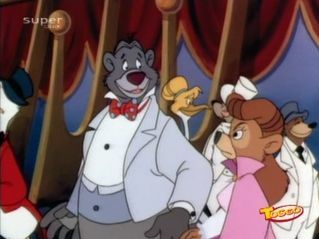 Kit suggests Baloo, however she thinks his manners would not fit in with the upper crust. After a crash course with Kit and Wildcat, all seems hopeless. But when Baloo finds that the dinner is on the Spruce Moose, the plane-turned-diner that was built so big it couldn't get through the cliffs of Cape Suzette, he becomes dedicated. That night, Baloo could not shake his old ways and Becky is embarrassed by his performance. When the Spruce Moose is suddenly hijacked by Owl Capone and his gang, it's up to Baloo to save the day. 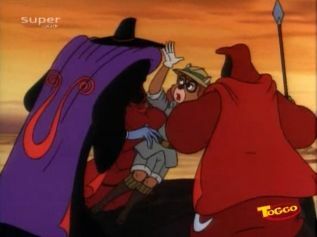 Don Karnage is sick of many a failing attempt to get into Cape Suzette. When he watches Baloo deliver lunch to the guards, he comes up with the idea of stealing The Sea Duck to infiltrate their defenses. 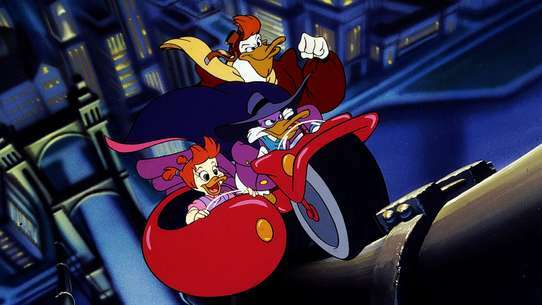 When Louie and Baloo get wise to their plan, they only have the time it takes the Iron Vulture to get from Pirate Island to Cape Suzette to re-arm the cliff guns. Thadeos E. Klang uncovers the Legendary Lost City of Tinabula and, with the help of Katie Dodd, starts to bypass it's traps and securities. Meanwhile Baloo and Louie are lost in the desert, wandering about trying to catch up to Thadeos. When Thadeos finds the city's 'weapon,' a device that uses sound waves to create sand storms that can immobilize anything that gets in it's way. Soon Baloo and Louie save Katie, but are pursued by Scarabs and minions. Katie tells them that they need to ring 'The Master Bell' to end Klang's reign of terror. But they need to solve the riddles and puzzles that stand in their way. When a reward is put on Don Karnage, he's insulted. 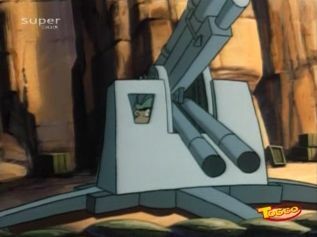 He puts on a full attack on the cliff cannons. When he's victorious, he decides to boast in an old fashion manner: on a hot air balloon. At that same moment, Baloo is delivering several canisters of glue from a glue factory. Don Karnage is knocked out of the sky and onto the Sea Duck. Once inside, the two quarrel knocking themselves out the rear hatch. When Karnage climbs back to safety, he heroically pulls Baloo up too. Then one of the canisters comes loose and covers the two. They become glued together. Since Karnage saved Baloo's life, he promises not to turn Karnage in for the reward in return. 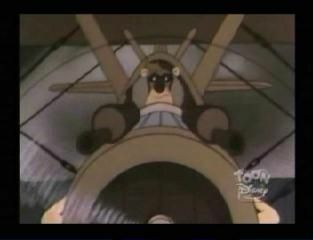 And the pirates think Baloo killed their captain, so they attack the Sea Duck. To make matters worst, they discover that they have until 6 o'clock (3 hours) to get back to the glue factory and un-stick themselves before it becomes permanent. Baloo is reading about the Great War pilot Ricky Sky, who vanished 20 years ago transporting silver for the war effort. The disappearance lead to the belief that he and his crew stole the silver for themselves. While avoiding Don Karnage and his pirates, he sees a distress flash from a downed pilot. When he stops to investigate, it's a man claiming he's the legendary Rick Sky. Baloo says that Rick sky would be 50, the man looks 30. When they return to Higher for Hire, Rick says he needs to restore the honor of squadron, for they were not thieves. Only he can't remember what happened the day of the disappearance. Becky won't give in, claiming this man cannot be Rick Sky. When Baloo sticks to his guns, he's surprised to find the man stealing the Sea Duck. Now Baloo must get his plane back, avoid Don Karnage and his pirates, and finally find out who this mysterious man really is. Baloo is told that he can no longer charge food at Louie's until he pays off his tab. Meanwhile, Becky comes up with an idea to start a midair refueling station. Baloo reluctantly agrees, as it is going to be located near Louie's, but decides he needs the money. After a couple days he's able to pay Louie back, who has had no business. 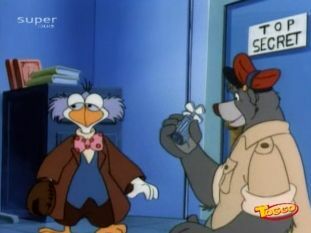 When Baloo reveals his source of income, Louie is furious as he's stealing all his customers. Not to be outdone, he opens his own midair refueling station. 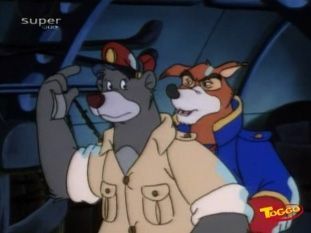 The two compete for better service, but when they start sabotaging each others stations, Baloo declares war. 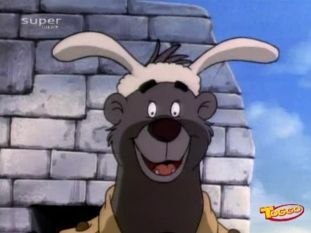 Baloo has to deliver a package to Walla Walla Bing Bang. While en route, they run into Airplane Jane, an old friend of Baloo's who beat him in a race years back. Since then, there's always been a rivalry between the two. Princess Grace of Walla Walla Bing Bang is being challenged to the right of the throne by her long lost brother Prince Rudolf. In order to prove her right to rule, they need to produce Queen Mureens Ruby Rings at the coronation. The Rubies were lost centuries ago in the mountains of Walla Walla Bing Bang and it's up to Airplane Jane to find it. But Baloo sees this as an opportunity to win the rivalry once and for all. 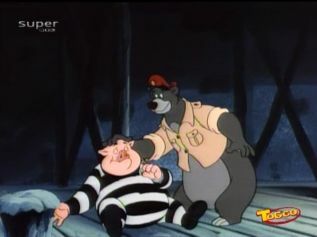 Baloo is put in charge of transporting Babyface Half-Nelson from Prison Island to Cape Suzette. However, Babyface has knocked out the officer transporting him and switched outfits. Baloo, who's never seen Babyface before, takes them back to Cape Suzette and let's Babyface walk away. When the officer awakens, he arrests Baloo for aiding in the escape of a prisoner. Meanwhile, Babyface's mother hires two goons to free her son, who also have never seen him. 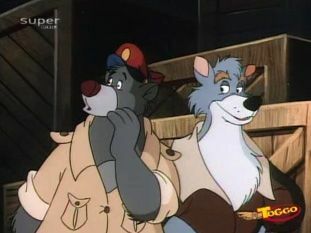 Baloo begs for forgiveness and the cops are about to let him go since he doesn't seem the type to work with gangsters. It just happens that right then, the goons nab Baloo, thinking he's Babyface. When they arrive back at their hideout, Babyface is already there. Since he knows too much, they order the goons to 'retire' him. With the cops now convinced that Baloo is working with Babyface and the gangsters out to kill him, Baloo has to do everything he can to clear his name. Baloo is reacquainted with Ace London, a highly regarded pilot. 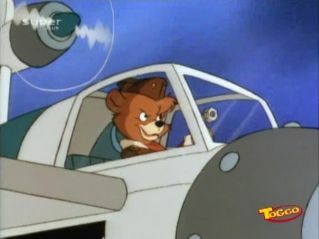 He belittles Baloo and boasts himself as the ace of the skies. They both have to pick up packages at the same cargo hold. 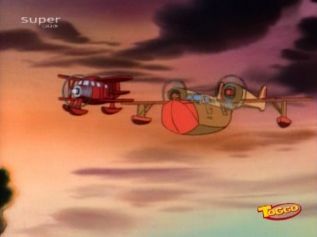 By Ace's ignorance, he picks up Baloo's cargo of pickles and Baloo picks up Ace's cargo: A Top Secret Plane Engine. Upon realizing his mistake, Ace claims Baloo stole his cargo. 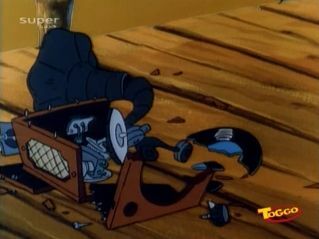 He then explains the mission to his reinforcements over the radio, which is being intercepted by Don Karnage. When Baloo doesn't respond to Ace, Ace opens fire on the Sea Duck. When he realizes that the whole ordeal is over the fact he has the top secret engine, he has to personally fly back to the military airbase to clear his name. While transporting Carnubian Kumquats back to Cape Suzette, Baloo takes a shortcut across a desert so they kumquats don't spoil as fast. However, they're shot out the sky by the Boomstone residents who are capturing people as slaves for their mines. Turns out the residents are employees of Shere Kahn, but have been forgotten about over time. They used to mine for silver, but the silver ran out years ago. Since then they've been mining Urgonium, a highly explosive rock, and have plans for selling them to the highest bidder. When Wildcat accidentally sets one rock off, his hat is knocked off and soot covers parts of his face. The new look has everyone mistaking him for Shere Kahn. The Sheriff cannot have Kahn returning to Cape Suzette, since they would then be out of a job. 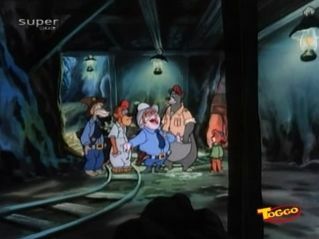 And on top of that, the slave miners want the Sea Duck to escape. Shere Khan is losing shipments when they are delivered on a route called 'The Master Run.' When planes approach the Twin Spires, they disappear off radar. Meanwhile, Baloo is flying blind when his headlights go out, until Kit comes up with a great idea to gets them home safely. But when the media gets a hold of the story, only Baloo gets the credit. On their second job, Kit saves a child from a fall. Once again, only Baloo gets the credit. Baloo consoles Kit saying that fame isn't everything, as long as you know who you are. Later that day, Shere Khan invites Baloo to his tower. 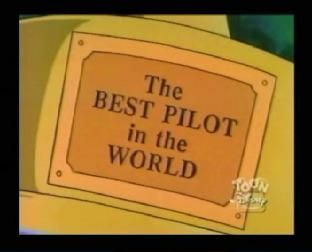 There, he gives him a trophy naming him 'The Greatest Pilot in the World.' He then offers him a job that requires him to go on The Master Run. Dumbstruck with his own fame, he accepts. But when he attempts to fly the run, he too falls the same fate of all the other pilots before him. Baloo asks Becky for his paycheck a day early. When she refuses, Baloo has a trick up his sleeve. He asks a local radio personality to say on the air Friday that it's Saturday. He then goes to Becky's apartment and changes all calenders to Saturday. And the cherry on top, a doctored paper that has Saturday for the date. When Becky awakens, she's convinced it's Saturday and Baloo is ready to collect his paycheck. But his plan soon backfires when Becky scolds him for forgetting his Friday deliveries and docks his pay until their done. 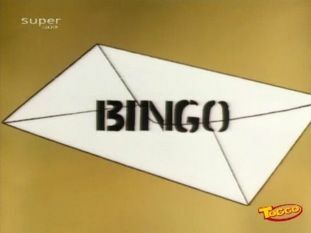 The cargo is to be delivered to Thembria, where Spigot and Dunder are (illegally) listening to the radio. When they hear it's Saturday, they inform the High Marshall that they need to change it to tomorrow, and then inform the citizens that denial it's Saturday results in death. This only leads to disaster for Baloo and Becky when they arrive and a fight for their lives. Cape Suzette is holding a Friendship Festival. Baloo decides to capitalize on this by selling hot dogs. 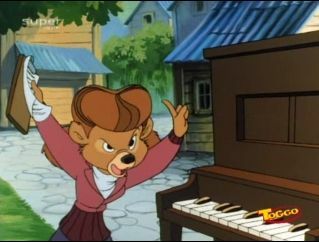 But before he gets a chance to sell one dog, Becky asks him to deliver a piano to a house located on a hill. Worried that the delivery would take all day, he tricks Dunder into helping him, despite the fact that he's supposed to be guarding a box containing the golden sprocket. Meanwhile, Trader Joe and his goons get interested in what's in the box, so they disguise themselves like hot dog vendors, which only leads to loads of mistaken identity. 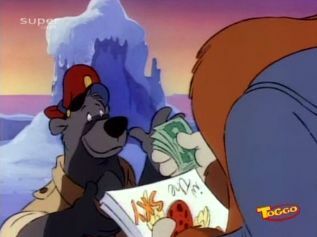 Baloo shows Kit his secret stash of cash he's saving up to buy back the Sea Duck. Then they go out to sea to fish and relax. When their bait of fish and peanut butter sinks in the water, it attracts a whale. After befriending it, Baloo and Kit head back to Higher For Hire. There, they find out there's a reward for the capture and return of the whale they found earlier. They contact Seymore of 'Seymore's See More Seaquarium' and the owner of Moby Dimple, the whale. 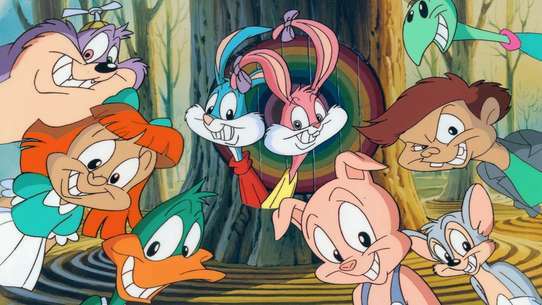 But after they return the whale, they find that Seymore mistreats all his animals. When they call an inspector on him, he has all the angles covered to pass inspection. 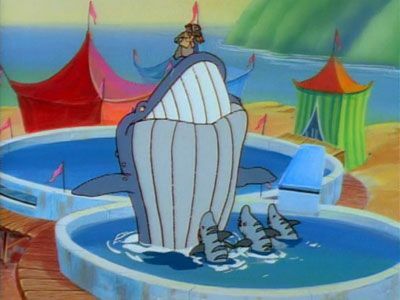 When their offer to buy the whale back with the Sea Duck money is turned down, Baloo and Kit decide that it's up to them to free Dimples by their own means. Everyone at Higher for Hire is working hard for a game hunter named MacKnee who wants his crate delivered. The crate contains a huge creature that gets big when it's wet and small when it's dry. Molly wants to play, but when she tries to get someone's attention it causes MacKnee's crate to fall off the pulleys and make a hole in the dock. The creature inside escapes through a small crack in the bottom of the crate and out the hole. Molly befriends the creature calling him Henry. She's able to keep him hidden from everyone since they're always occupied. But when MacKnee finds out his creature's missing, he forces everyone to aid in it's recapture, even when Henry starts to fly back to it's homeland with Molly on it's back.